I recently watched, like many of our readers, the interview (1, 2) with Mike Daisey regarding the conditions under which Apple products are made in China. And at the risk of fomenting conflict with Mr. Daisey, I would like to editorialize on the topic in slightly broader and harsher terms. Actually, it’s not that I disagree with the man, exactly. It’s that he doesn’t go far enough, and in doing so conveniently avoids requiring himself or anyone else from doing anything but being concerned. If you’re going to take on ideas like globalism, corporate responsibility, and cross-cultural morality, you don’t get off that easy. You can’t establish a predicate like “the way our lifestyle is made possible is immoral” and somehow avoid unpleasant conclusions. The “great sin” isn’t Apple’s, or any one of the other major international corporations that use Foxconn or similar megafactories. And it isn’t Foxconn’s either. It’s clearly, inescapably, ours. Now, I’m not going to get all Das Kapital on you. The idea here is simpler and closer to home than some grand idea of political and economic metatheory. The basic fact is this: an “ethical” iPhone would be too expensive. That’s literally all there is to it (replace iPhone with your device of choice). Everything follows from our own unwillingness to pay for the true cost of a device. People want a better world, but they don’t want to pay for it. Nothing new there, really. To pretend otherwise is plain hypocrisy. The question is whether we are willing to take responsibility for our own immorality? We’re too cheap to care where our goods come from. Admitting to anything less is ridiculous. There are precious few who will take door number one. It means giving up nearly everything that makes up the life of a first-world citizen. Very little in the way of consumer electronics, cars, and other status symbols is manufactured ethically. Door number one is abandoning the pleasant inequality inherent to the modern world. Can we be expected to do that? I guess it depends entirely on what we expect from ourselves, so I’m going to guess that no, we won’t be doing it. Door number two is where you’ll find most people. I’m not sure how one does it, but you can apparently take the moral high ground while continuing the actions you condemn. Politicians have no trouble doing this, but their airport-bathroom dealings aren’t usually public (public information, rather). And millions of people will buy bottled water while deploring the state of the third world, and not feel the hypocrisy leaking from every pore. Last year everyone made a lot of noise over the supposed iPhone 4 suicide. The outrage was quickly forgotten and everyone became angry instead at Apple for a design flaw in the device. Easy come, easy go. Door number three is the door I’ve taken. I’m not strong enough to live without the technology I’ve grown up with, and which forms the underpinnings of my everyday life. I’m proud to admit that – proud because I don’t pretend otherwise, which is a completely different moral error — the error of self-deception. It is only after admitting the failings in your own moral character that you can even attempt to see others with clarity. I know the right path, and have chosen not to take it. How many of us can really say any different? A lot of philosophical wheel-spinning, sure. And to be sure, I’m not making the world a better place. But I’m not giving people the false impression that all that’s standing between us and a better, more ethical tech world is some vague concept of “awareness.” No – it’s like the false consolation you get when you tweet with a trendy political hashtag or change your profile picture to “support” a cause. Real change comes from real actions (like those in Egypt, and it is significant to note that lack of internet has not affected their ability to effect change), and although being aware is the first step towards that, it’s also an easy step at which one to stop and feel satisfied with oneself, as Malcom Gladwell pointed out some time back. What can you or I do to make things better? Short of door number one, there’s not a lot. The scruples of the few who can be made to care don’t really amount to much in a market a billion strong. We can’t do anything about this, and we should feel bad about it. The blame is ours, after all: we demanded lower prices, a new iPhone every year, 50″ HDTVs, and have never considered how such things are even made possible. Our culture has produced this situation, in which our every act can easily be considered an immoral indulgence. So will we change our culture? It’s more likely that the current situation will only get worse, the way it’s been getting worse for decades. Globalization reduces our grip on the way things are run, with predictable results — but the alternative is, of course, higher prices. You do the math. And while we take a breath, I want to add that this isn’t just about Foxconn. The conditions there, or at Hon Hai, or elsewhere in Shenzhen or the other factory cities, are a completely different discussion, for then you begin to evaluate the relative evils of a well-run 800,000-employee company and, say, the toxic landfills sifted through by children for spare parts. •As Daisey suggests, a third-party organization that grades products and companies on the conditions of their manufacturing, ecological soundness, and so on. As this organization would require thousands of employees, access to trade secrets, an international presence, universal acceptance by companies, and so on, I don’t see it happening any time soon. “Green” products are in the throes of these problems at this very moment. At any rate, it’s more likely that a company will set their own internal standard and the consumers will be too lazy to look into the difference. For that matter, any scheme that relies on vigilance at the consumer level is a foregone conclusion, as we’ve seen from the last 50 years of increasing consumer-level carelessness. Daisey’s call for journalists to look into things independently is admirable, but the fact is these conditions aren’t new, and people don’t seem to care. •Requiring by law an “ingredient list” or certification describing the origin of every product. But controlling or even knowing the entire supply chain, from raw material to finished product, is something even the biggest companies in the world have very limited ability to do, and have little interest in attempting. I like the idea, though, and this is something that is becoming more important on an international scale. It would require quite a lot of international cooperation, and right now it’s all we can do to not nuke each other. Maybe when we’ve backed off from mutual annihilation, we can take a few years to let us feel better about our purchases. Also requires consumer awareness — not a good plank for the platform. •Consumer intervention: buy only products made in the US (or EU, for example). Works for, say, corn, but for devices using parts manufactured in 10 different countries, in billion-dollar facilities made for that purpose? Don’t forget why we make things in China: not because of “cheap labor,” but because China has invested a huge amount of money to be the only viable option for most tech manufacturing. Batteries, transistors, camera sensors, memory cells — the infrastructure to create these has been laid over decades by a regime with unparalleled control over the people and economy. Not only would similar attempts in the US be blocked as too expensive, but the products they created would never leave the shelves, as they would likely be significantly more expensive and not necessarily better made. As for establishing a “second China” elsewhere, I think even the most up-and-coming countries are decades behind in creating tech- and manufacturing-centric economies. •Pay more. I don’t see this catching on. I won’t go on any longer. I don’t want to sound like I have the answer. All I wanted do do was point out that the situation is clear: our entire society has irreversibly become reliant on factors over which we have long abdicated control. Every day, we add to the list of our offenses. I see no bright future for this aspect of the tech world; we’ve left the helm to others for too long, and it’ll be years and years before we can even turn the ship around, much less get it where we want it to be — assuming we even try in the first place. Before anything else, though, let us reflect seriously on the profound mistakes we are making, individually and as a society, so that we will be less likely to make them again. This means admitting unreservedly our continuing complicity in (among other things) the employment of underage workers in hazardous circumstances, and admitting unreservedly the selfish and short-sighted motives that motivate that complicity. 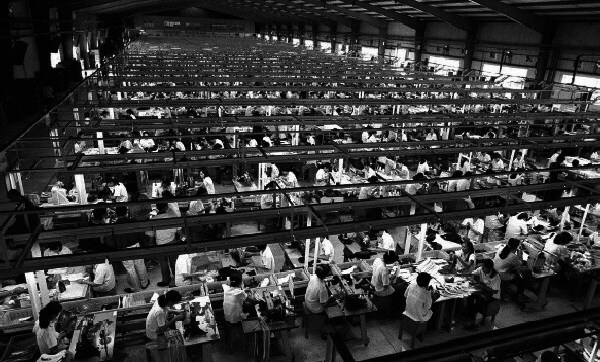 We may not be able to make iPhones, but hopefully we can still manufacture a conscience.